Happy Tuesday, everyone! 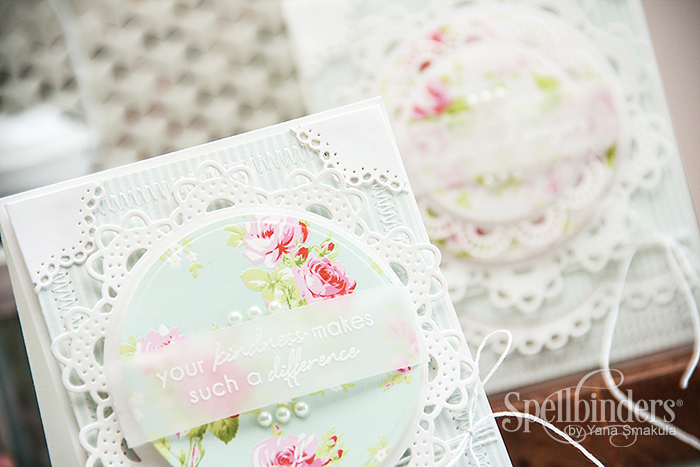 Today I am excited to share two cards using the Circle Delight die templates from the Heart & Home collection from Spellbinders. The cards that I’ve created are almost identical. The only difference is in the amount of layers and papers. You can see both of the in detail on my video, here I’ll only share one. I’m also sharing a video tutorial showing how I created these cards. I’m sharing a simple way to make corners for your cards using die cuts and talking about a fun way to add a sentiment to any card. Enjoy! I used several dies from Spellbinders to create these cards – Circle Delight set and Standard Circles Small set to create the focal point and the corners; A-2 Matting Basics A set to die cut a base panel and finally A2 Scalloped Borders One set – love using borders from Card Creator collection for my standard size cards (A2 or 5×7 cards). I also added stitching to this card – I stitched the base panel along with die cut borders; I feel stitching can add so much to handmade cards. The sentiment, Your Kindness Makes Such A Difference was heat embossed in white embossing powder onto a strip of vellum and was wrapped around the top circle. Love both lovely cards! Thanks for sharing. Beautiful cards!!!! 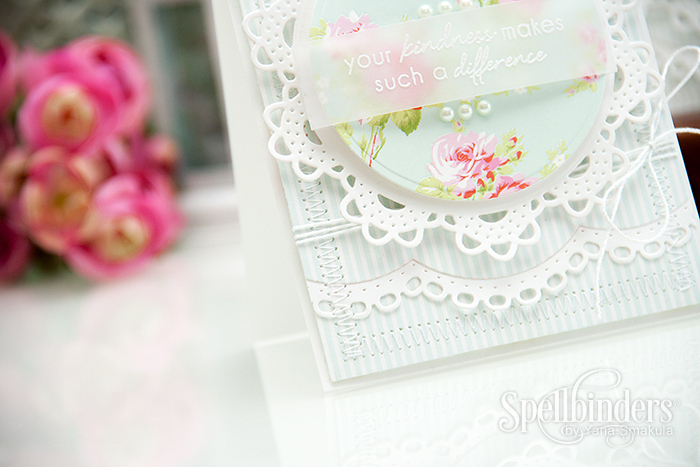 Love the new circle delight die. Absolutely beautiful cards! These dies are gorgeous, thank you for the video:) I was wondering what paper pad you used on these cards? It’s so pretty! Beautiful cards, super video. I like more layers. thank you so much, Lynne! I like less layers. These are gorgeous cards. Thanks. Lovely and elegant cards. I like your work so much. Thank you so much, Kira! aaaaw, Nina-Marie, thank you so much! Sorry I can’t choose…BOTH ARE GORGEOUS! I really don’t have that “crafty” fingers…but this video is tempting me to buy this machine…yes it’s your fault for this impulsive buying spree! Lol! Thank you sooo much for sharing your amazing ideas and talent! Keep those creative juices flowing..we love it! haha, you’ve put a smile on my face, Emily! Thank you so much! Hugs! Honestly, if I can make this card..I’d be selfish enough to keep it for myself! Who would want to part with such beauty? Shame on me!! 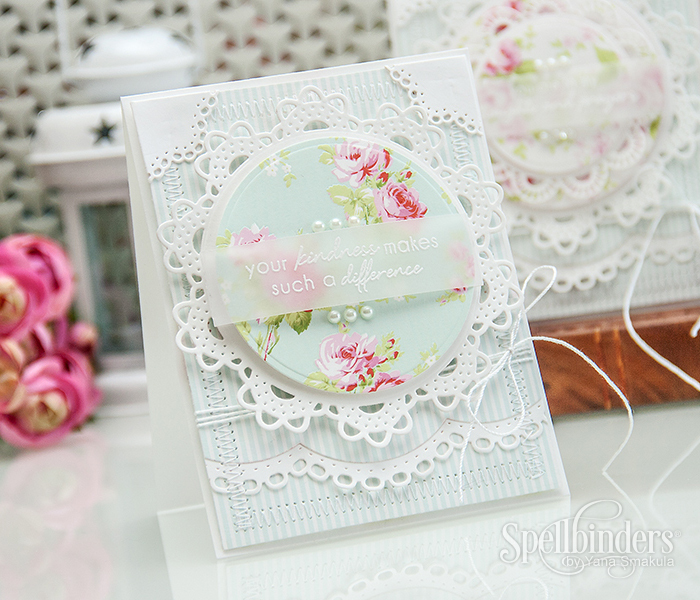 Thanks for sharing with us your gorgeous cards! Normally I would like the one with more layers, showing the beauty of Spellbinders dies. However, in this case, I prefer the one with less layers, which, simply because the rose background paper is so beautiful! Beautiful cards Yana!!! I think I prefer the card with less layers, but it might be because the color of the designer paper and I really want to enjoy that with all of the other details. I like your idea of how you attached your vellum, and I especially LOVE the corners!! Thank you for sharing your work with us. Still love this card.. I made one too..
found it 🙂 its lovely! THANK YOU for sharing!